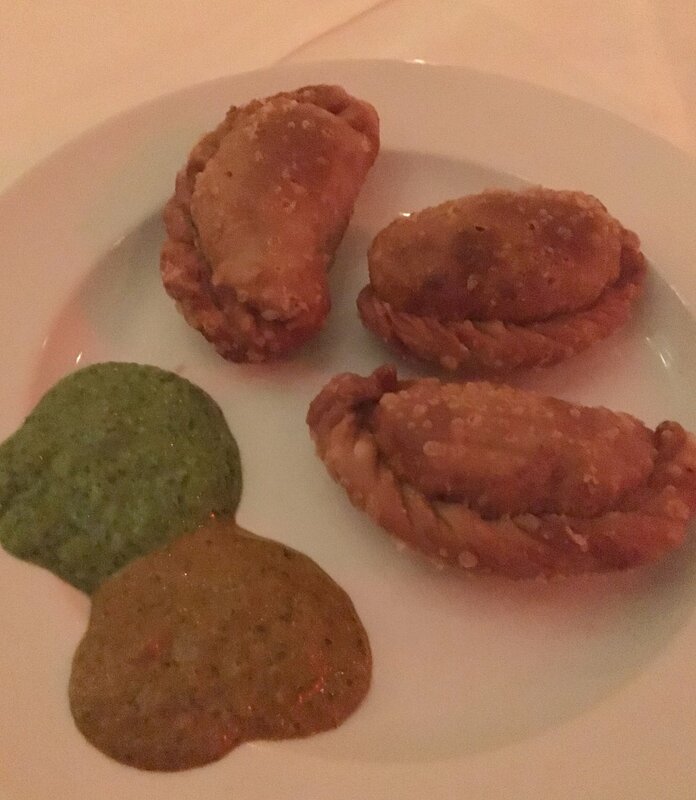 I love Argentinian food and I recently had the pleasure of visiting Chimichurri Grill East. There are actually two locations in Manhattan - one on the East Side and one on the West Side. This night, I was visiting the newer location on the East Side. The facade of the restaurant does not adequately portray the size of this place. There are 3 rooms inside, each leading from one to the other. You will enter in the Tango Bar, which holds the bar and seating for 16 people. From there, you can walk into the Pink Room, which is a bit more casual and can also seat 16. The Pink Room then opens up into the Main Dining Room, which is elegantly decorated with a gorgeous Italian crystal chandelier, custom made chairs, an Argentinian cow hide mirror, and walls lined with beautiful photographs of herbs and spices taken by co-owner and chef Carlos Darquea. The Main Room seats 60. The Main Room will be rearranged each Tuesday night to accommodate Tango Nights, starting December 5th from 7-10pm. Tango dancers will be able to come and enjoy dancing underneath the beautiful chandelier. These are not professional dancers, but rather dancers who just enjoy to dance. A few weeks ago, New York City removed the prohibition-era ban on dancing in restaurants and this has allowed Carlos to create such an event. Before I get into the food, I also want to mention that there is a happy hour in the Tango Room and the Pink Room every Monday through Saturday from 4-8pm. It includes Argentinian bar bites and small plates, special Argentinian wines by the glass, martinis, and beers. Once we arrived at the restaurant, Carlos greeted us and presented an impressive tasting menu, which paired 7 of his favorite dishes with unique wine pairings, in addition to a dessert. He and his wife worked on assembling the wine pairings and impressively, they were spot on with all of them! Our first course was Ostras, or grilled oysters. I confess that I'm not usually a fan of oysters but these were amazing. I spritzed the oysters with the lemon juice to make it a bit more tart. Carlos also added a bit of Argentinian regianito cheese on top of the oysters which was very tasty. You might not think of adding cheese to seafood or oysters in particular, but it really worked here. This was paired with an excellent dry Argentinian sparkling wine. For our second course, we had the Berros salad, which consists of watercress, tomato, avocado, red onion, and cilantro with a squeeze of lime and olive oil. I truly enjoyed this salad. It was light and fresh and included all of my favorite ingredients. It was paired with a nice Torrontes wine. Next up, we had a lovely grilled Branzino filet - Branzino a la Parrilla. This was served over grilled asparagus and with a grilled Meyer lemon on the side. The grilling of the lemon gave the juice a smoky flavor when the lemon was squeezed over the fish. The fish was flaky and tender and paired nicely with a glass of Chardonnay. For our fourth dish, we enjoyed the Cerdo San Pablo. This is grilled pork with an agave glaze which is served over sauteed red cabbage, apples, onions, and bacon lardons. 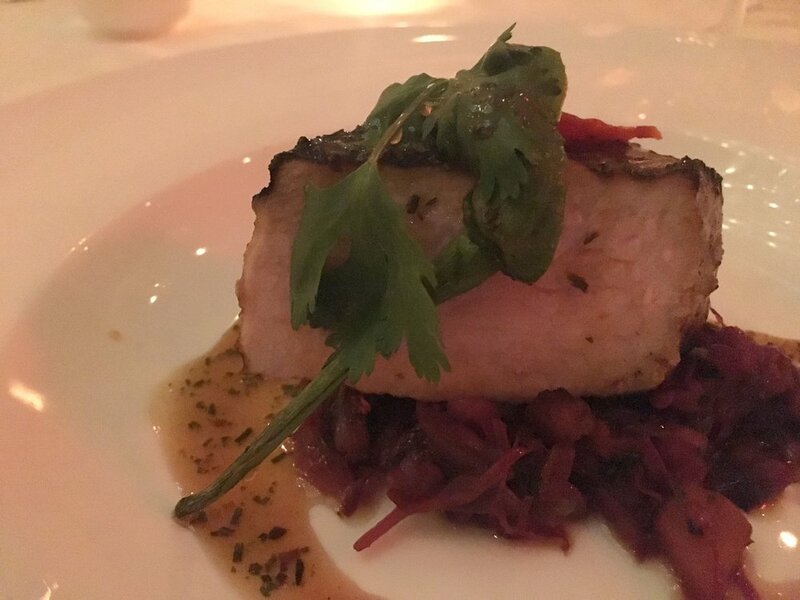 While I really enjoyed the pork, when it was paired with the sauteed cabbage mixture, it truly stood out to me as one of the best dishes I had that evening. This was successfully paired with a Meritage wine (80% Malbec + 20% Cabernet). 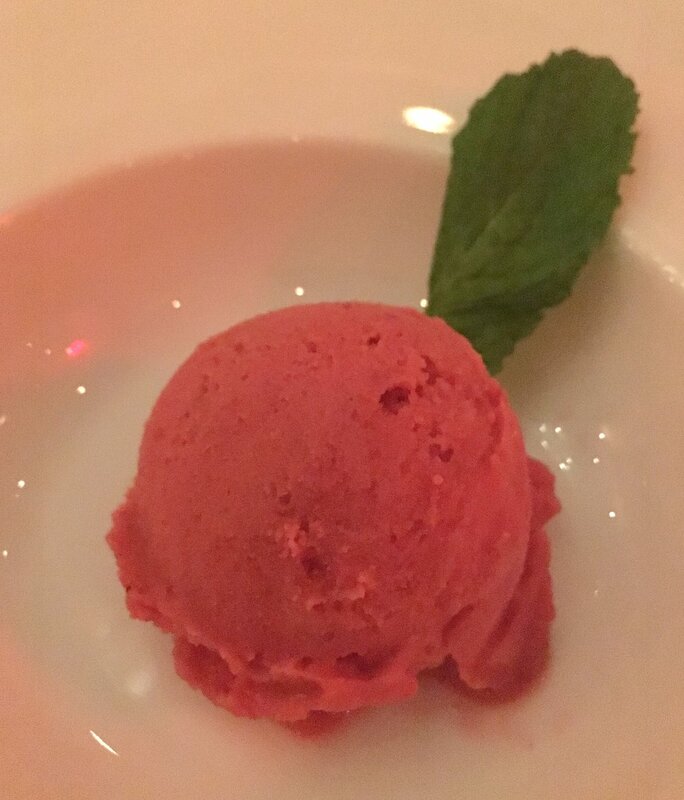 At this point, we took a quick pause for a homemade raspberry sorbet to cleanse out palates. This was nice, clean, and refreshing, as it was intended to be. Up next, we have the fifth course. Since receiving the tasting menu, this was the course that I was most looking forward to. I absolutely love empanadas and can never get enough of them. These were small tasty bites filled with organic chicken, grass fed beef, and swiss chard and manchego cheese. On the table we had small bowls containing two types of chimichurri sauce - red and green. Yes, there is such a thing as red chimichurri sauce. These made excellent partners for the empanadas. This dish was one of the highlights of the meal for me. These were paired up with a Pinot Noir. 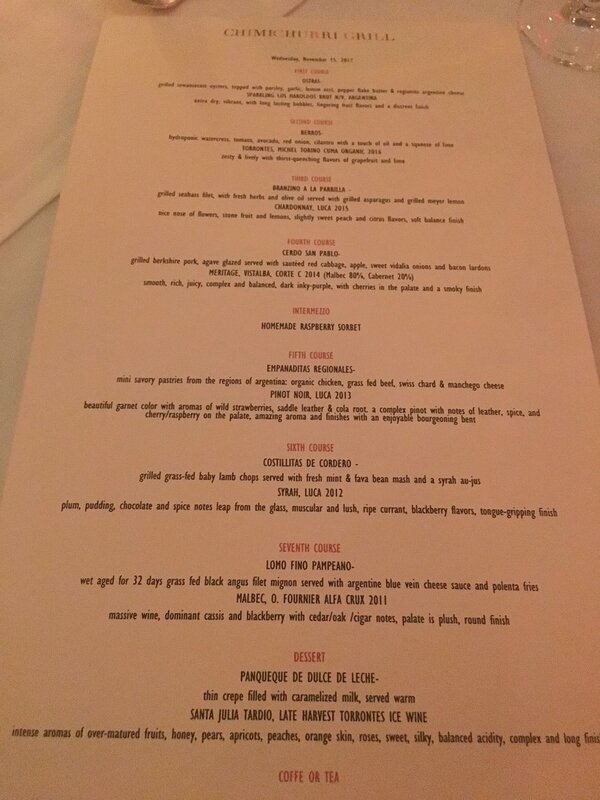 For our sixth course, we started to delve more into the meats. We had beautifully grilled lamb chops served with a fresh mint and fava bean mash. 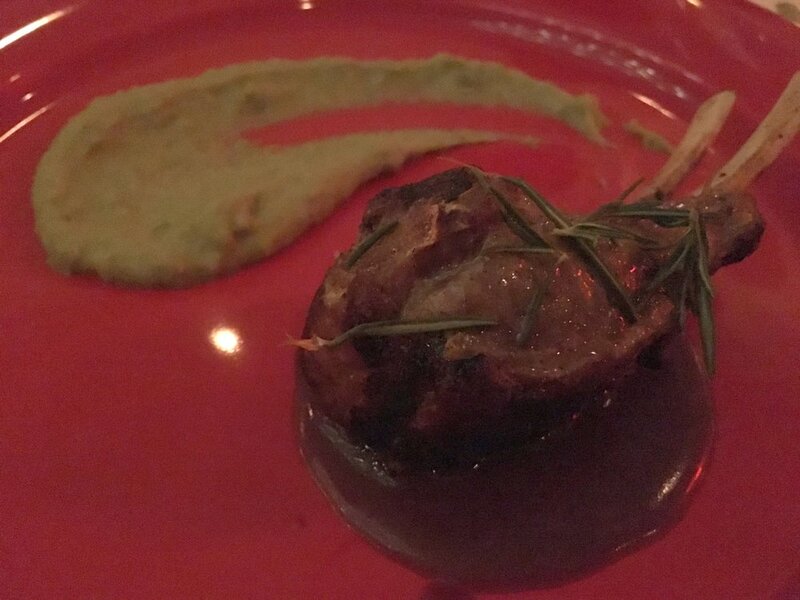 The lamb was plated over a syrah au-jus sauce. This was another excellent choice by Carlos. The meat was simply delicious and I ate every last bit of it. I cannot say enough about the mint and fava bean mash either. This was paired with a Syrah. We finally made it to our seventh course! This was a wet-aged black angus filet mignon, which was perfectly cooked so that it turned out tender and juicy. It was also served with an Argentine blue vein cheese sauce and polenta fries, which were quite delicious. This was paired with a Malbec. For dessert, Carlos brought us a Panqueque de Dulce de Leche. 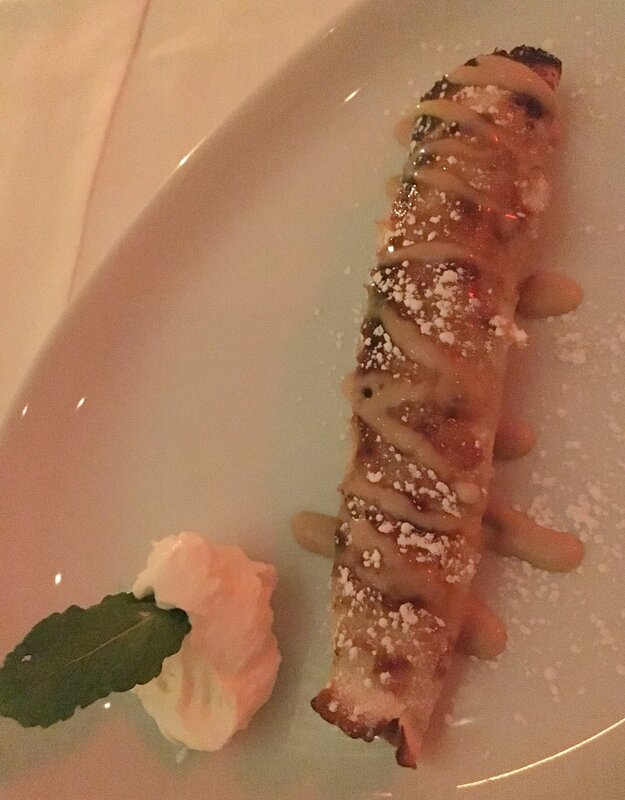 This is a thin crepe, served warm and filled with dulce de leche. This was the perfect end to this meal. It was paired well with a beautifully sweet Torrontes ice wine. I would highly recommend checking out the Chimichurri Grill. Everyone there is really nice and friendly, as well as very knowledgeable about the food and wine that was being served. I can't say enough about the food. It was a great experience and I really look forward to dining there once again.